Sensi seeds Northern Lights #5 x Haze takes the finest elements of sativa and Indica genetics and combines them in what many consider to be the best cannabis strain ever created. Northern lights #5 x Haze is Sensi seeds most admired cannabis strain and has been used to produce countless other strains. NL5 x Haze produces tall plants with enormous buds which drip with resin. The effect is classic Sativa with a soaring high that is unsurpassed. Opposites collide in perfect hybrid fusion! Feminized Northern Lights#5 x Haze balances the finest features of soaring tropical Sativa and voluptuous, earth-shaking Indica. Universally regarded as a high-point in cannabis breeding, many weed scholars consider her unsurpassed. Her tendency to make a permanent impression on people owes a great deal to the fact that her Sativa genes are fully and joyfully expressed, instead of being dominated by the power of her Afghani parent. 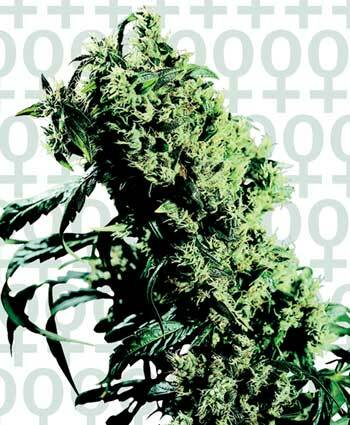 Expect significant height gain from feminized Northern Lights#5 x Haze. Gaps between internodes are quickly filled by long, running colas. At the mid-point of blooming main stem and branches are completely obscured by sticky, profusely hairy buds which then swell in every direction until the end of flowering. It’s quite common for Northern Lights#5 x Haze to produce terminal buds longer and thicker than an arm!